In our last program, we told the story of the Statue of Liberty, given to the United States by the people of France. The "Lady of Liberty" holds a bright torch high over the harbor of New York City. Her torch of freedom was a welcome signal to millions of immigrants arriving to begin a new life in America. American life was changing. And it was changing quickly. Before 1860, the United States had an agricultural economy. After 1860, the country began to change from an agricultural to an industrial economy. In 1860, American shops and factories produced less than 2,000 million dollars' worth of goods. Thirty years later, in 1890, American factories produced ten thousand million dollars' worth. By then, more than five million persons were working in factories and mines. Another three million had jobs in the building industries and transportation. Year after year, production continued to increase. And the size of the industrial labor force continued to grow. 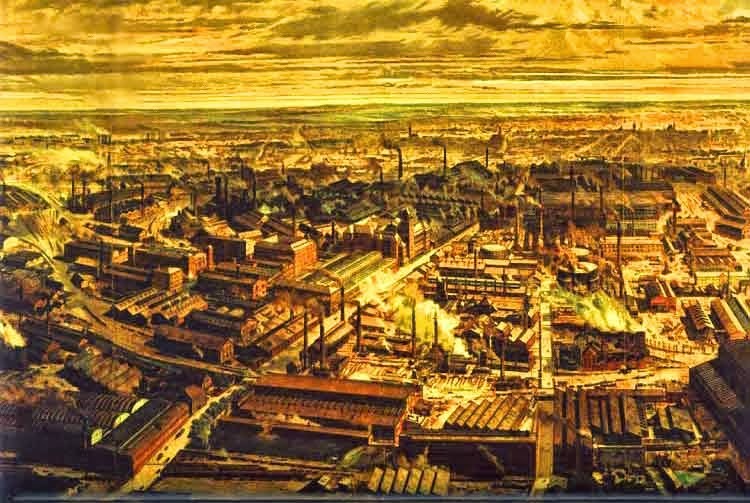 In the 1850s, America's industrial revolution was just beginning. Factories needed skilled workers -- men who knew how to do all the necessary jobs. Factory owners offered high pay to workers who had these skills. 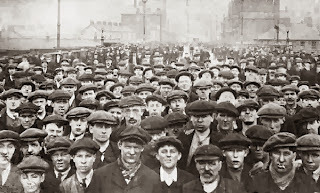 Cloth factories in Fall River, Massachusetts, were filled with young men from Lancashire, England. Most of the workers in the shipyards of San Francisco were from Scotland. Many of the coal miners in America were men from the British mines in Wales. One of the best-liked songs in Britain then was a song about the better life in America. Its name: "To The West. " Its words helped many men decide to Make the move to America. To another group of immigrants, America was the last hope. Ireland in the 1840s suffered one crop failure after another. Hungry men had to leave. In 1850 alone, more than one hundred seventeen thousand people came to the United States from Ireland. Most had no money and little education. To those men and women, America was a magic name. As the years passed, fewer people were moving to America for a better job. Most were coming now for any job at all. Work was hard to find in any of the cities in Europe. A British lawmaker told parliament in 1870 that Englishmen were leaving their country, not because they wanted to, but because they had to. They could not find work at home. He said that even as he spoke, hundreds were dying of hunger in London and other British cities. They were victims of the new revolution in agriculture and industry. Small family farms were disappearing. In their places rose large modern farms that could produce much more. New machines took the place of men. And millions of farmers had to look for other work. Some found it in the factories. 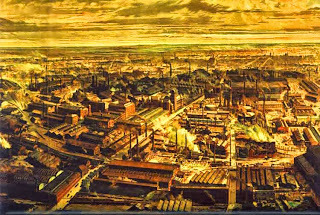 Industry was growing quickly...but not quickly enough to give jobs to all the farmers out of work. In the next ten years, millions of people made the move from Britain, Germany, and the Scandinavian countries. But then, as industry in those countries grew larger, and more jobs opened, the flood of immigration began to slow. In the late 1880s, cholera spread through much of southern Italy. 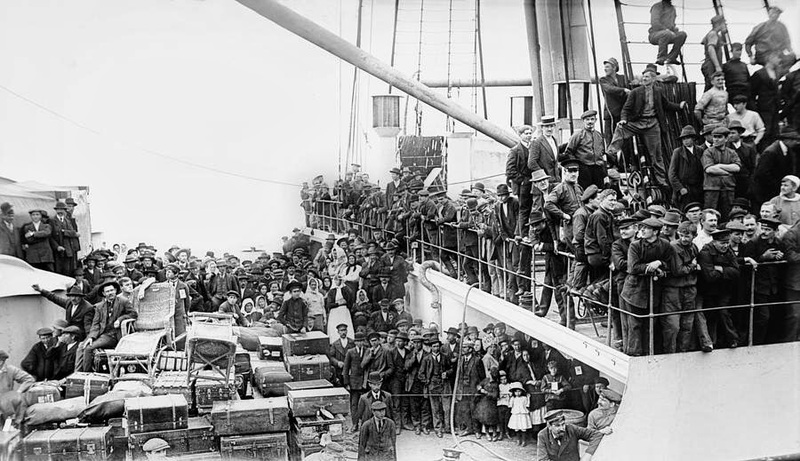 Fear of the disease led many families to leave for the United States. Whatever the reason, people continued to immigrate to the United States. These new immigrants were not like those who came earlier. These new immigrants had no skills. Most were unable to read or write. Letters from America brought many more immigrants. The big steamship companies also helped industry to get more of the new workers. They paid thousands of agents throughout Europe to sell tickets for the trip to America. Their efforts meant that steamships bringing grain to Europe could return to America filled with immigrants. Within a few years, foreign-born workers held most of the unskilled jobs in many American industries. American workers began to protest. They demanded an end to the flood of immigration. You have been listening to THE MAKING OF A NATION, a program in Special English. Your narrators were Leo Scully and Maurice Joyce. Our program was written by Frank Beardsley. 1. By the 1890s, most of the unskilled jobs in the United States were held by ___________________ . 2. Factory owners preferred to hire eastern and southern Europeans because these workers _________________________ . 3. A large immigration from southern Italy occurred in the late 1880s because of ___________________ . 4. Immigration to the United States slowed down when __________________ . 5. Poland and other countries formed organizations to ____________________ . 6. In 1850, many immigrants came to the US from Ireland because ____________________ . 7. Young men left family farms because _______________________ . 8. By 1890, more than five million people were working in _________________ . 9. One of the first sights an immigrant would see in New York Harbor in the 1890s was ____________________ . 10. Before 1860, the United States had ____________________________ .